Apple's been busy this week: if a new iPhone wasn't enough, there's a new version of Safari for Mac and Windows users too. The new browser has a new version number, too - this is Safari 5. Some of the new features are tiny but useful. There's arevised address bar that's smart enough to search entire URLs for your text; the ability to make Safari the browser that Bings by changing the default from Google to Bing - but some are considerably bigger. The biggest new feature is Reader mode. 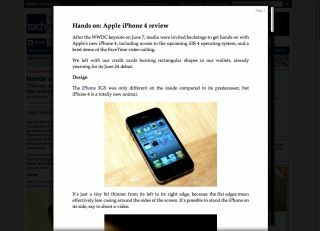 When you're visiting a site that Safari reckons contains an article, the word Reader appears in the address bar; click it and the ads and layout disappear, replaced with a clean white page with the article text on it. If you've used the excellent Readability bookmarklet or used a word processor in 1993 you'll be at home immediately. Reader doesn't just strip the ads: it also takes multi-page articles and stitches them together, which is good news for readers and bad news for sites that split their articles into bits to maximise page views. It doesn't work with everything, though, so for example sites that insist on Powerpoint-style slideshows for the simplest nuggets of information aren't Reader-ised into punter-friendly format. We suspect it probably won't work for long, either: if ad-funded sites suss out that Reader is depriving them of ad views, it's just a matter of time before they find a way to evade it. The Extension Builder tool is bundled with the browser (although you'll need a certificate from the Safari Developer Program to use it) but Extensions themselves are disabled by default. It's impossible to say whether Safari Extensions are worthwhile until we've seen some; for now it's a feature for the developers, as is the tweaked Web Inspector for viewing how Safari handles your web page code. As we've come to expect from new browser versions, Safari 5 delivers better performance than before. Windows users now benefit from hardware acceleration, while all users get Chrome-style DNS pre-fetching for faster link loading. In the real world the difference is negligible, though, and when we tried Office Live (admittedly out of sheer amusement at the thought of running Office inside Apple and Google browsers) there was no noticeable difference in the two browsers' performance. Last but not least there's HTML5, with support for a bunch of new HTML5 tags. Existing video support has been enhanced with support for full screen mode and closed captions, and Safari now supports geolocation. As with the iPhone, you'll be asked before Safari shares your location with anyone. Does it deserve a whole new version number? Probably not: Reader aside, Safari 5 is more about the promise of new things than the delivery of new things, so better HTML5 support will be useful when more sites use HTML5 and Safari Extensions may well be useful when they finally appear. It's always nice to have improved performance, though, and Reader mode saves the odd bit of eye strain. It's hardly essential and it's unlikely to tempt Chrome or Firefox users away, but if you're already a Safari user it's a worthwhile update.